I’m 35 weeks pregnant – seems like that’s come out of nowhere and suddenly feels like everything is VERY real and I’m sort of running out of time! 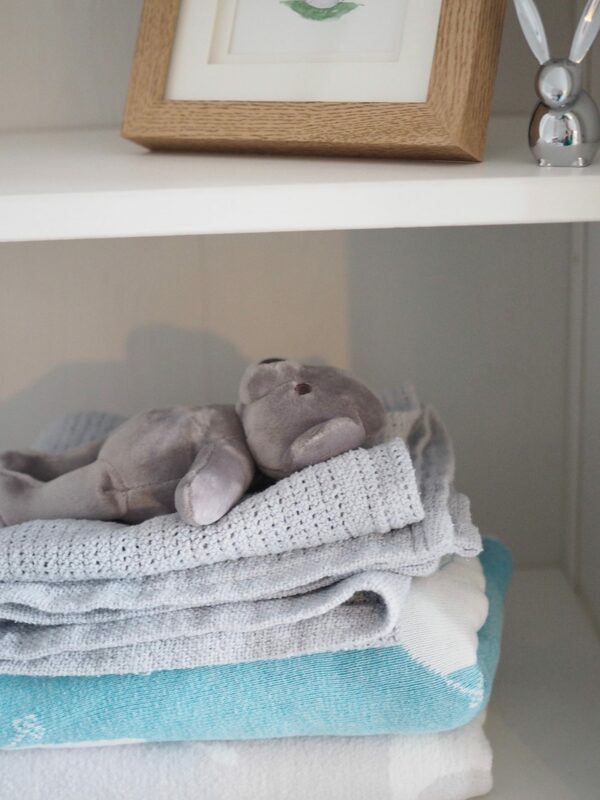 But I thought it might be a good time to share a bit of an update on where we are with preparing for baby, how I’m feeling and all that fun stuff. I realise I haven’t shared as many updates as I maybe wanted to when I first found out. No reason really, other than not wanting to bore those who come here more for beauty updates! I’ve tried to make a bit of variety in there rather than just weekly updates. In all honesty, week on week I haven’t had all that many changes so updates would have read a little samey. But it’s been 10 weeks since my last ‘week’ related update, so enough has changed since then that hopefully a bit more interesting. I had my latest midwife appointment last Monday, seeing my ‘regular’ midwife for the first time since the 16 week appointment. SO glad I did as she’s absolutely lovely. I’ve had a few not-great encounters with other midwives at other appointments – not awful as such, but ones that haven’t left me feeling like I either had the answers I wanted or that I was quite being supported in the way I’d hope. For example when I asked for some information about epidural the immediate response was ‘you shouldn’t even be thinking about epidural’. Which I found pretty disappointing – I want information, not to be hooked up to an IV as soon as I ask! Personally, my approach as I get closer to the actual birth part is that I want information. I want to be able to ask questions and have as much information as possible (knowing that still a lot is very unpredictable) so at least when faced with choices or uncertainty, I’ll know and understand what I’m choosing or ‘letting myself in for’ if that makes sense. My regular midwife was brilliant though, happy to answer questions and very supportive of talking pain relief – as she puts it ‘asking for pain relief does not make you a better mother’ – a view I very much feel is on my wavelength. Baby preparation wise, we’re almost there. We went a bit from zero-sixty after Christmas where we really got cracking with making lists and buying up the bits we need (and probably many items we don’t ‘need’ but are adorable… ). I’m going to do a few posts on what we decided to go for and why and all the bits we did preparation wise. So any questions or things you might want me to cover on that front, please do let me know. My bump: Yep. Feel like I’m 90% bump, 10% adult human. Weight changes: Still not really sure and avoiding weighing myself. Still fitting into some of my usual (non maternity) clothes so taking that as a good sign. Not jeans/leggings though! Stretch marks? So far, nope – still slathering on all sorts. Something I need to do a blog about. Cravings: Still way more of a sweet tooth than usual. Also drinking lots of milk – something I had previously cut out, but loving a glass of cold milk every morning at the moment. Sleep: Not great, waking up in the night for the loo a lot and general discomfort overnight. Tending to wake up around 3-5am ish. FUN! But as they say… good practice! Symptoms: Still bouts of heartburn. General aches and pains. This week has been a bit of an emotional rollercoaster in a way I’ve not experienced since the first trimester. Anything and everything has been making me cry. Including the most minor things or massive existential crisis type stuff. Totally normal…. Best moment this week: Seeing my friends, I’m very conscious that when baby arrives I’ll be in a bit of a baby bubble for a while and won’t be out and about as easily or often as I am now. So I really want to make the most of being able to see friends now. Worst moment this week: The emotions. Even when I know it’s the hormones, having days where everything makes me sob haven’t been fun. Some of it has given me the chance to talk about some of my bigger worries around the baby arriving with Ollie, so that has been positive. But have also found myself sobbing at facebook videos about dogs. Friday in particular was a low day and it was just exhausting! Upside, I did sleep like a log on Friday night. Gotta look on the bright-side! Miss anything? Missing normal clothes, would LOVE a bloody mary. Miss being able to put my shoes on without groaning. I miss being able to sleep all night. 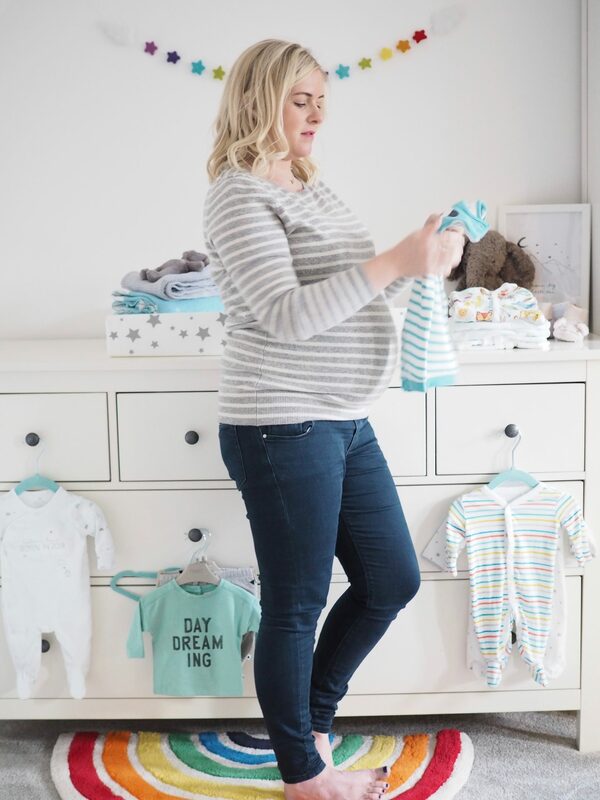 Maternity clothes: I’ve started wearing a pair of Blanqi support leggings – they’re really comfortable and meant to be good during pregnancy and beyond. If you’re considering a pair, I’d size down, especially if you’re between sizes. Other than that, not bought anything new – other than a new pair of wire-free bras. Pretty sure I have all I need now. If anything I’ve started picking up a couple of bits to look forward to wearing when I’m sans-bump. Movement: Yep, lots of elbowing and poking. Mostly on one side and can visibly see my bump moving around as baby wiggles. Most of the time it’s really reassuring and lovely, but there are almost moments where it’s quite uncomfortable. Gender: We know, but going to hold off saying now until baby arrives. Belly button in/out: In, but very shallow…. ! Wedding Rings on/off: Wedding ring on, but not wearing my engagement ring as it was a bit more snug and was worried about it getting stuck! Mood: All over the place. Lots of sobbing this week. I’m fine and can tell it is hormones not a consistent feeling of being blue so not worried in anyway. I’ve just tried to take some time to do those little things that can make me feel happier. Looking forward to: Getting the baby’s room finally set up. We have most of the bits but not all ‘in place’ yet. Having my hospital bag packed. Baby actually arriving and then not being pregnant anymore!